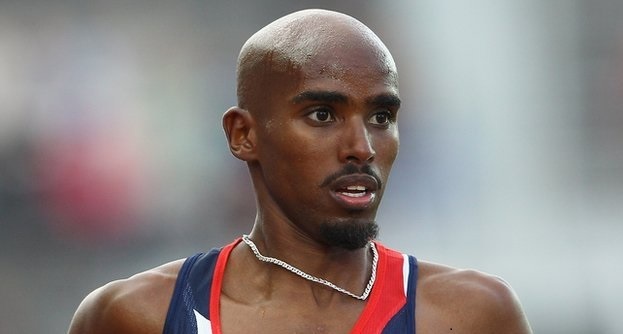 A month shy of his debut race in the marathon, Olympic 5000 and 10000 meter gold medalist Mo Farah had a harrowing experience at the New York City Half-Marathon this past weekend. Less than halfway through the 13.5-mile trek from Central Park to lower Manhattan, Farah fell when his feet got tangled with another runner. He got back up and went on to finish second overall, but then after crossing the finish line, Farah collapsed and had to be taken away in a wheelchair. Farah described his post-race fall as “passing out,” but said he was OK. The race was seen as a preview to the April 13 London Marathon, where Farah (a Muslim from Somalia who represents Great Britain) will compete against Kenyan superstar Geoffrey Mutai, winner of the last two NYC full marathons. Mutai won the NYC Half on Sunday.